A friend we met through blogging while he was stationed in Iraq recently came home. On his way from North Carolina to Wisconsin, he made a zigzag to meet us for dinner in Pennsylvania last night. Welcome home, Wyldth1ng! Pictured are Presbyfruit, me, Wyld, and Ladyburg : 4 blogging addicts. 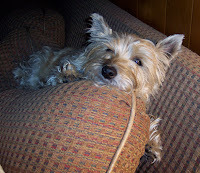 ...and here's a cute picture of my dog. I noticed that the face of the spill plane was way out of square to the sides. Here is one way to remedy the problem. Use your marking gauge to set the width of the shallow side, then referencing the fence off the same flat surface, run the gauge along the thicker side and both ends. 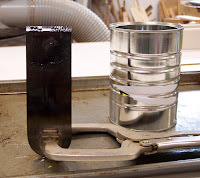 This shows you how much to remove with a handplane. Check your progress until it's square. 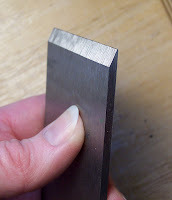 To make the wedge, lay a scrap piece, along with the plane iron, in the bed of the plane blank and mark it with a pencil. Leave ex tra length on the wedge until you're ready for final fitting. 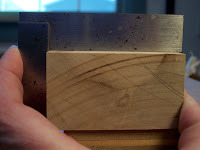 I roughed the shape out on a band saw and then planed it smooth. 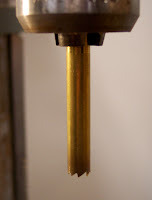 To drill the escapement hole, I made a simple jig to hold the plane blank. 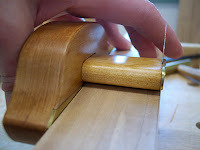 The angle of the jig needs to match the angle of the cutting edge of the blade as it's resting in the bed*. 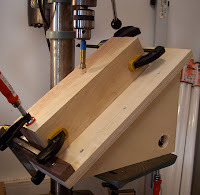 I clamped the blank to a piece of scrapwood to support the forstner bit as it drills the hole. 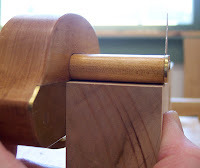 Two pieces of walnut, one to sandwich the wedge and iron in the blank and the other for the escapement hole, are attached with screws. 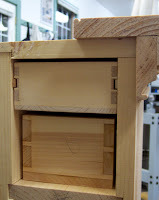 Once you attach the first piece, you can final-fit the wedge. Tap the wedge in, along with the plane iron, and wiggle it a bit to s ee if it is providing even pressure along the blade. If it wiggles, that means the wedge is not properly seated and is rubbing on a high spot. 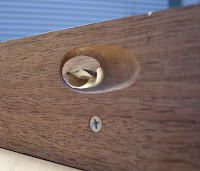 When you pull the wedge out, you will see shiny spots on the wood. That's where it's rubbing. Plane, scrape, sand, or file that off and keep re-checking the fit until the wedge secures the blade in place solidly. Before final shaping of the plane, I just had to check to see if it works...it does! Now I have to make it look pretty by squaring up the ends, chamfering the edges, shaping the wedge, and giving it a shellac finish. *This article was used extensively in making this plane. 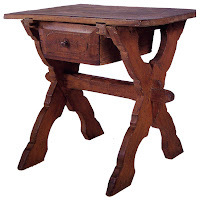 It provides cons truction details and photos that are a terrific reference. At last count, there were exactly 3, 970, 000 ways to sharpen a plane iron. Well, maybe it just seems like that many. The point is, you have lots of techniques from which to choose, and all produce the same result—a sharp blade. 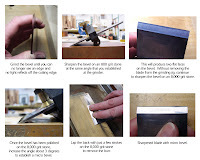 Here are photos showing how I sharpen a newly-made plane iron using a grinder and 800 and 8,000 grit waterstones. Make sure your stones are flat. I flatten mine sometimes twice during a job like this. 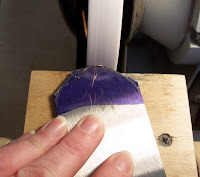 Flatten the back of the blade on an 800 grit stone. By gripping a piece of wood on top of the blade, you can apply greater downward pressure than you can with just your fingers. 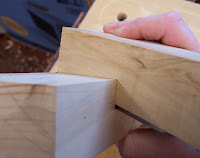 Keep the blade flat as you move it forward and backward on the stone and just concentrate on the 1/2" or 1" that is clos est to the cutting edge. Once you have uniform flatness, do the same thing on an 8,000 grit stone until you achieve a mirror polish. I hadn't sharpened the bevel on this blade completely before heat treating, so it's back to the grinder to finish sharpening before using the waterstones. Here is where you'll want to be sure to dunk the blade in water as you sharpen at the grinder so that you don't overheat the blade. Keep your fingers close to the cutting edge because if it's too hot for you, it's too hot for the blade, and you'll know to quench it. For safety precautions, always wear a facemask at the grinder and let it run for a minute to warm up before grinding. You should also check to make sure your grinding wheel is not cracked. Do this by removing the wheel, slide a pencil through the center hole so it's suspended without you touching it, and tap it lightly with a plastic handle. It should ring like china. If you hear "thunk", throw it out. You are finished with the grinder once you can no longer see light reflecting on the cutting edge. 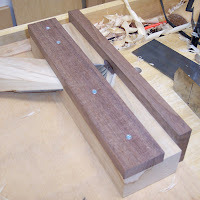 Next, secure the blade in a sharpening jig at the same angle you established at the grinder. In this cas e, 25 degrees. Start with the 800 grit stone and only sharpen on the pull stroke. 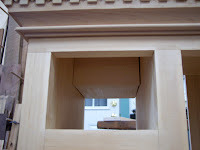 When you have two flat surfaces on the bevel, move to the 8,000 grit stone without removing it from the jig. 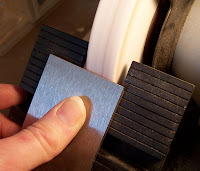 Once polished to a mirror finish, angle the blade up about 3 degrees in the jig (with some jigs, you don't have to reposition the blade; you can just turn a knob and it will steepen the angle for you) and create a micro bevel using the 8,000 grit stone only. A micro bevel is not necessary; it's just my preference. You will now have a small burr on the back of the blade which can be removed with a few laps on the 8,000 grit stone. You're done! That blade will now shave endgrain, hairy legs, and your neighbor's cat. Before you heat treat and temper your plane iron, cut it to shape, because the untr eated steel is much easier to cut and grind beforehand. There are a number of detailed articles online for the heat treating and tempering process, so here is just a brief rundown when working with O-1 tool steel. I use one propane and one mapp torch (Why? Becau se that's the way I was taught). 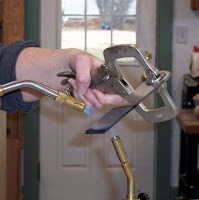 Clamp your steel in locking jaw pliers at an angle so that when you dunk it in the oil (I use peanut oil) and the oil flares up, you won't burn yourself. Position the blade in between the two flames, about 1" from both, so the blade is heated from both sides. Keep the blade moving so the heat is distributed equally across its width. Start heating the blade about 2" from the cutting edge. With a blade this thick and wide, it will take a while to get it hot enough (it took maybe 6 or 7 minutes). Once this part of t he blade gets orange, start moving the flame toward the cutting edge until the entire 2" end is orange and glowing. Quench it quickly, dropping the blade straight down into the oil so the width of the blade is cooled equally, otherwise it may warp. The oil will flame for a bit. Keep moving the blade back and forth in the oil while it cools. I'd give it several minutes, then tak e it out, wipe it off, and let it cool enough for you to touch it. Your blade will now be black. Before you temper it, you need to remove the black coating so that you can see the color of the blade as it's being tempered. You can remove the coating by rubbing the blade on a sheet of fine drywall screen or sandpaper that is resting on a reliably flat surface, like thick glass or granite. Now you're ready to temper the blade. Bake at 350 degrees for an hour but keep an eye on it, as ovens temperatures vary. Other sources say 20 minutes at 400 degrees. When the blade becomes a straw color, it's done. Let it cool completely and you're ready for final sharpening. 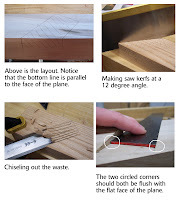 You can get pretty technical with this whole process, and if you're a stickler for perfection or if you must have consistent and accurate results in making blades, you'll want to do more research than this post. But because I'm just a hobbyist, and chemistry and metallurgy make my brain hurt, this works just fine for my needs. 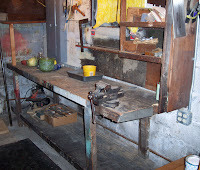 Here is another article on tempering steel, by Ron Hock, of Hock Tools.